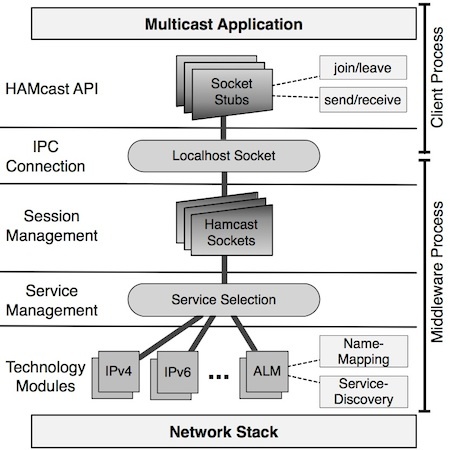 HAMcast provides a system architecture for a universal multicast service. The concept combines an abstract naming scheme (based on URIs), a common API and a system-centric service-middleware, as well as gateways (IMGs) to cross technological and administrative network borders. The HAMcast network stack is developed at the ​INET research group, HAW Hamburg. The current software release contains the multicast API (C++ & JAVA libraries) for group application development, the middleware as a userspace systemservice, and several multicast-technology modules. An additional tool set including a hybrid tree monitoring is supplied, as well. The HAMcast stack is still work in progress, comments and contributions are very welcome, join our developers mailing list. (16.) New HAMcast release available, see here. Its a minor update to version 0.7.1! (26.) New HAMcast release available, see here. Its version 0.7 now! (20.) New HAMcast release available, see here. Its version 0.6 with many improvements! (24.) HAMcast Demo Presentation at EuroView 2012, see ​http://www.euroview2012.org/. (21.) New prototype release available, see here. Updated common multicast API and bug fixes! (13.) New prototype release available, see here. Including Java client library with common multicast API! (13.) Java API DoxyGen-Docu online, see [doxygen:java/index.html here]. New prototype release incl. Java API soon. middleware13.jpg​ (67.2 KB) - added by meiling 5 years ago.